GPON is a fiber optic network which provides connection from one point to multiple points. It is a fiber-to-the-premises type of network, which offers several connections through unpowered splitters and a distinct optical fiber. Optical splitters are energy efficient and they do not require power for transmission of signals. The GPON chipset market is witnessing significant growth, due to rapid changes in technologies in the FTTH/FTTB sector. The global GPON chipset market is projected to reach value of US$ 3,103.8 Mn by 2026, expanding at a significant growth rate of 6.7% during the forecast period. Major driving factors for the global gigabit passive optical network chipset market are low cost of ownership and high returns on investment. In addition, higher bandwidth, unmatched security, and greater reliability offered by GPON chipsets are likely to drive the GPON chipset market, especially in India, during the forecast period. Moreover, increasing digitization and mass adoption of smart and connected digital devices by businesses, governments, and consumers are other factors expected to fuel the market in the next few years. However, limited range capability of GPON chipsets is acting as a hurdle in the adoption of GPON chipsets across the world. The GPON chipset market has been segmented based on technology, equipment, end-use industry, and geography. Based on technology, the market has been divided into 2.5G-GPON, 10G-GPON, XGS-PON, and NG-PON2. In 2017, the 2.5G-GPON segment accounted for the maximum market share. However, the NG-PON2 segment is expected to expand at a significant rate during the forecast period, owing to numerous advantages offered by this technology such as multi-channel compatibility, flexibility, and improved performance compared to its counterparts. In terms of equipment, the global GPON chipset market has been classified into optical line termination (OLT), optical network unit (ONU), and optical distribution network (ODN). The OLT segment accounted for nearly 58% of the market share in 2017. Based on end-use industry, the GPON chipset market has been segmented into hospitals, residential, IT & telecom, government institutions, and others. In 2017, IT & telecom segment accounted for a leading market share. The residential segment is projected to expand at a significant CAGR during the forecast period. This is primarily attributable to high demand for next-generation GPON chipsets for high-seed broadband services. In terms of geography, the global GPON chipset market has been categorized into North America, Europe, Asia Pacific, Middle East & Africa, and South America. Asia Pacific holds a major share of the global market, followed by North America and Europe. Over the last decade, there has been rapid conversion from wireless to wired optical communication in China. This transition phase is further driving the market in the region and making the country extremely favorable for penetration of GPON chipsets. Moreover, the market in Asia Pacific is expected to expand rapidly between 2018 and 2026, due to ongoing technological innovations in the region. The market in Middle East & Africa is estimated to witness growth at a moderate rate during the forecast period. The GPON chipset market in South America is expected to witness sluggish growth from 2018 to 2026. 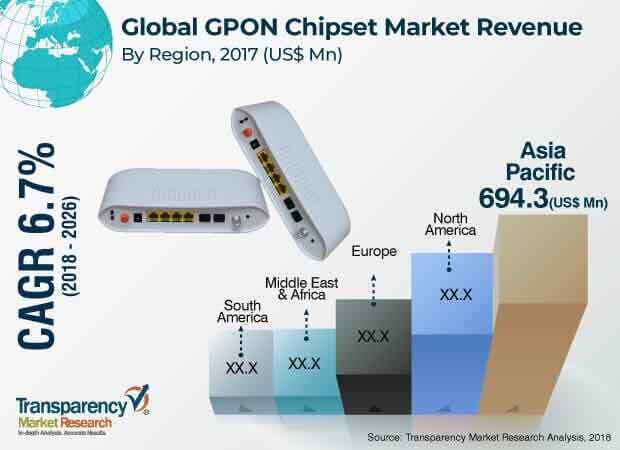 Key players profiled in the GPON chipset market report are Adtran, Inc., Alphion Corporation, AT & T Inc., Broadcom Inc., Calix Inc., Cisco Systems, Dasan Zhone Solutions, Fujitsu Ltd., HiSilicon Technologies Co., Ltd., Huawei Technologies Co., Ltd., Marvell Technology Group, Motorola Solutions, NXP Semiconductors, Realtek Semiconductor Corporation, and Zyxel Communications Corp. This comprehensive report by Transparency Market Research analyzes and forecasts the GPON chipset market at the global and regional levels. The report provides analysis for the period from 2016 to 2026, wherein 2018–2026 is the forecast period and 2017 is the base year. A comprehensive and unbiased market assessment has been made to provide readers with in-depth and accurate analysis. The report emphasizes all major trends anticipated to be witnessed in the global GPON chipset market from 2018 to 2026. It also focuses on market drivers, restraining factors, and opportunities for the GPON chipset market during the forecast period. The study provides a complete perspective on the GPON chipset market, in terms of value (US$ Mn), across various geographies including North America, Europe, Asia Pacific (APAC), Middle East & Africa (MEA), and South America. The report includes detailed value chain analysis, which is focused on providing an extensive view of the global GPON chipset market. Porter’s five forces analysis has also been provided to help understand the competition scenario of the market. The study incorporates market attractiveness analysis, wherein technology, equipment, and end-use industry segments of the market have been benchmarked based on their market size, growth rate, and attractiveness. In order to offer complete analysis of the competition scenario in the global GPON chipset market, every geographical region mentioned in the report has been provided with attractiveness analysis. The report highlights competition scenario in the global GPON chipset market, thereby ranking all major players according to their geographical presence and key recent developments. The insights for the global GPON chipset market is a result of TMR’s extensive primary interviews, secondary research, and in-house expert panel reviews. Market estimates have been analyzed by considering the impact of different economic, political, social, legal, and technological factors. Primary research involves telephonic interviews, e-mail interactions, and face-to-face interviews conducted for obtaining detailed and unbiased reviews on the GPON chipset market across geographies. Primary interviews are usually conducted on an ongoing basis with market experts and participants in order to obtain the latest market insights and validate the existing data and analysis. Primary interviews offer new information on important factors such as market trends, market size, competition landscape, and growth trends. These factors help validate and strengthen secondary research findings. Moreover, the data collected and analyzed from secondary and primary research is again discussed and examined by TMR’s expert panel.